Cronuts. Brookies. Donnolis. S'moreos. The world of mash-up desserts, or the "hybrid trend", as it has been called by food consultants and PR peeps, has pretty much gotten out of control. But as annoyed as you may want to be with the trend, the fact is...if some is good, more has the potential to be amazing. And so we continue to--excuse the pun--eat it all up. 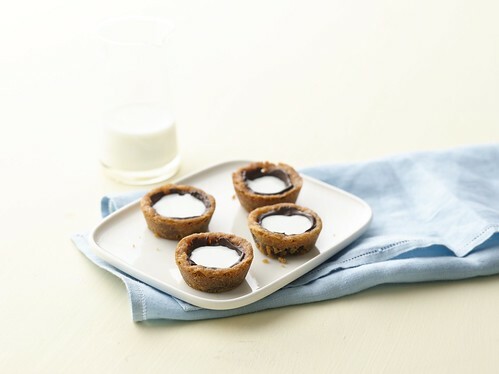 A recent dessert hybrid dreamed up by cronut creator Dominique Ansel was the chocolate chip cookie "milk shot"--a cup made of chocolate chip cookie, enforced so that it could hold milk long enough to take it as a "shot" and then eat the vessel from whence it came. It never hit as big as the cronut, but I still think it's a pretty nifty idea, because how many desserts can actually allow you to utter the words "I'm gonna get milk and cookie CRUNK right now!"...? Seriously. No other dessert I can think of. But of course, I didn't want to do EXACTLY what they told me to, so I thought "why don't I do a Millionaire's shortbread spin?". It was quite easy to do: I used sugar cookie dough instead of chocolate chip, then added a layer of caramel (since I think I'm pretty cool sometimes, I made my own) atop which I added a layer of chocolate. 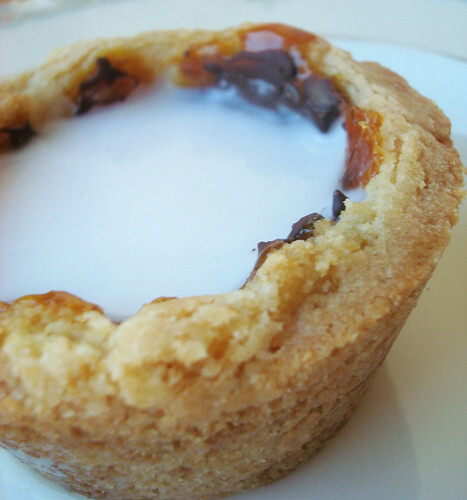 These fat cookie confections held the milk perfectly, and after a minute or two it begins to soak in to the rest of the cookie and soften the caramel. 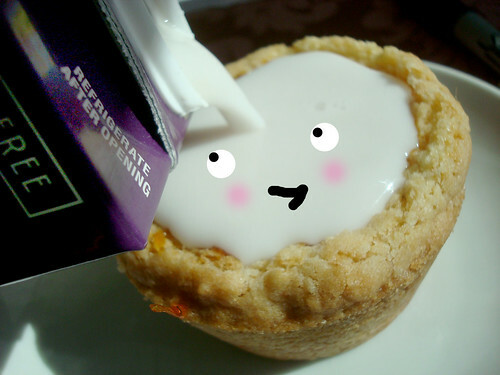 You can either drink the milk then eat the cookie, or break it apart and then let the pieces "soak" in the spilled milk for a while longer. No matter how you decide to eat it, the unrefutable truth is that these things are delicious. I mean, sugar cookie dough, caramel, chocolate, a touch of salt, and milk too? There is no part of this equation that is wrong or bad. The taste is classic, but the method of presentation and the mode of eating is fun. And isn't that what dessert is about, joy and fun? Preheat the oven to 375. 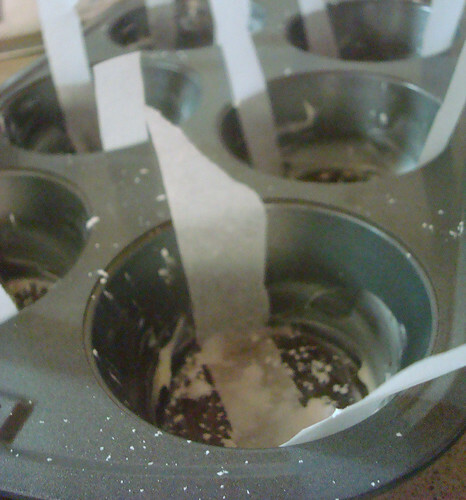 Generously grease the cupcake tin, sprinkle each cup with confectioners' sugar, and place a sheet of parchment along the bottom (for easy removal later). Why not just use cupcake cups? I didn't want the ridges on the sides. You can use the cups if you don't mind the ridges, though. No judgment. 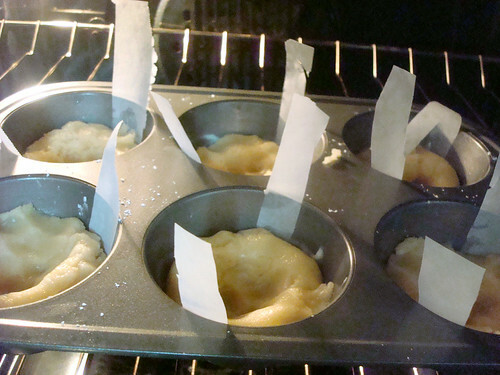 Grab big fistfulls of dough and press them into each of the cupcake cups. Press a dent in the center. You want the cups to be about half full of dough. 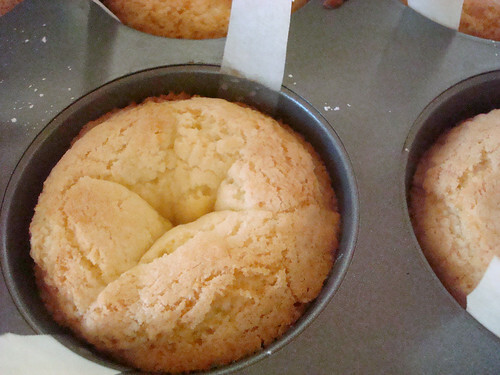 My entire batch was sufficient to fill a 6 cup "texas sized" cupcake pan. This is to say, these cups were no mere shot glasses. They were fatties. 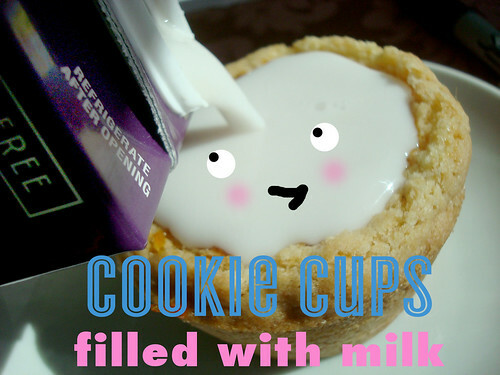 Now, bake the cookie cups. Since mine were so thick, they baked for about 25 minutes--longer than the time you'd bake the dough if you were making mere cookies. My advice? Keep an eye on their progress around the suggested cookie bake time, but then keep them in the oven until they are puffy and golden. 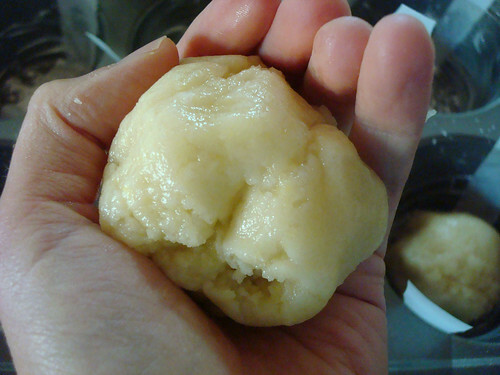 Once puffy and golden, remove from the oven. They will start to deflate in a matter of minutes. This is actually a good thing for you. After 5 minutes or so, approach with a spoon and knife. 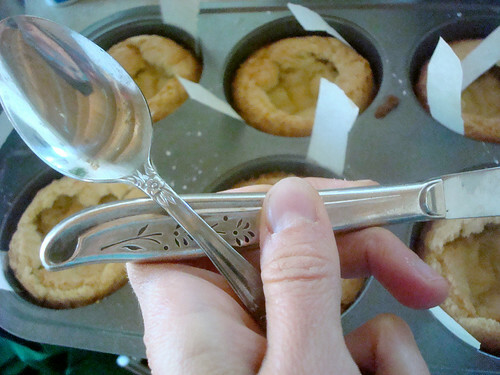 First, use the knife to loosen the edges of each cookie cup to ensure easy removal later. But keep them in the cupcake tin. 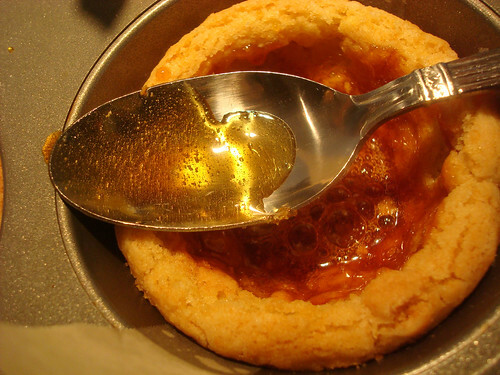 Now, use the spoon (or go ahead and use your impeccably clean hands) and press the cookies into a more pronounced cup shape. Let the cookies cool for about 30 minutes in the cups. Now, make your caramel. 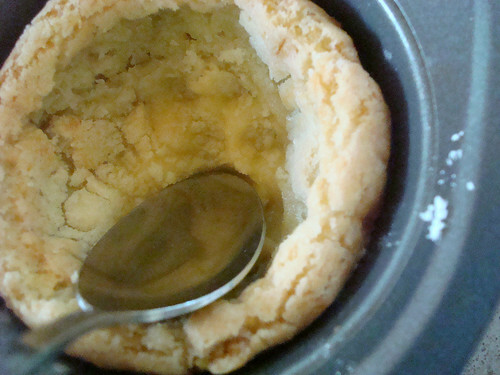 Simply put the sugar in a dry saucepan, and put it over medium-high heat. Caramelize it per the instructions in this tutorial. 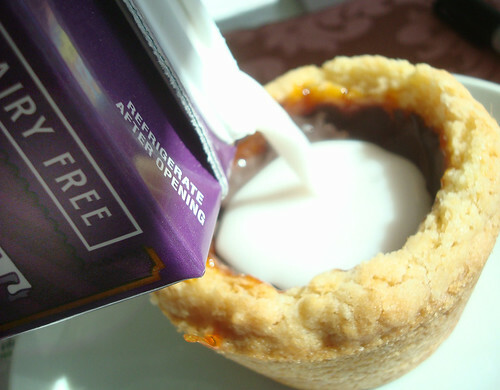 Once liquid, pour a little into each cookie cup and spread using a spoon to ensure even coverage inside of the cup. 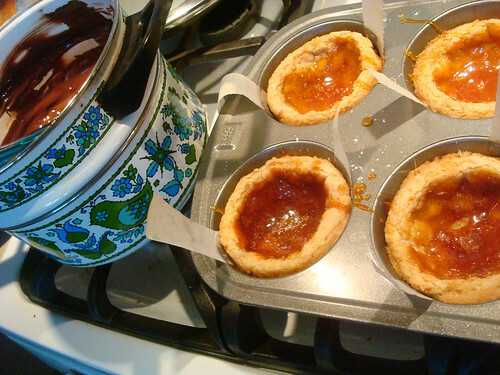 Let the caramel set for about 30 minutes before proceeding. Now, melt the chocolate in the top of a double boiler. 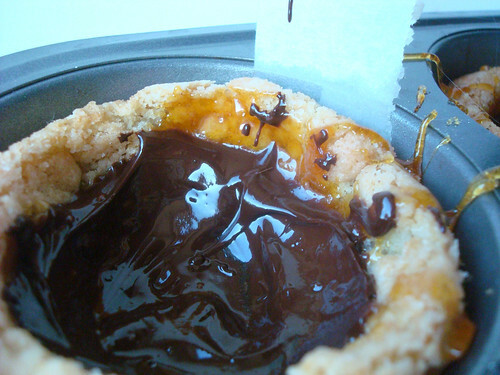 Once melted, pour some on top of the caramel layer in each cup and spread so it covers the inner cup evenly. Don't make it too thick or you won't have anywhere to put your milk. 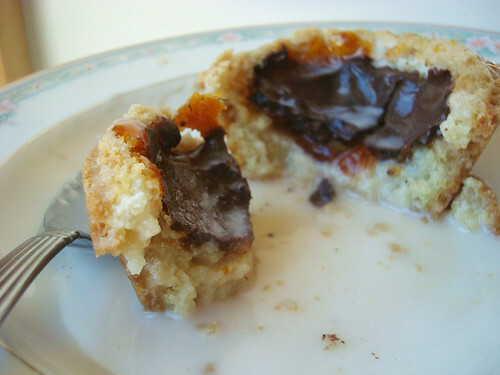 Let the cookie cups set again, this time for 2 hours or so, until the chocolate has become firm. Once the chocolate is firm, you're ready to serve! 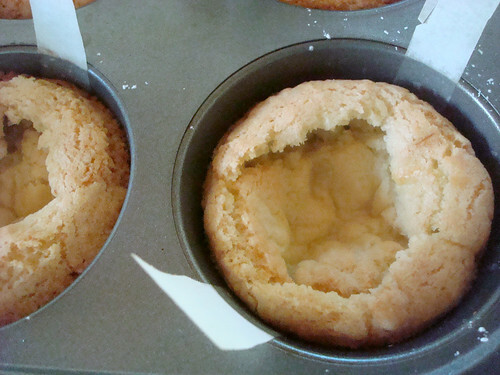 Remove the cups from the cupcake tin. Place each serving in a shallow bowl (just nicer in case the milk seeps out). Fill each cup with milk--pour it right in. And serve! It's nicest to let the milk sit for a minute or two before drinking and devouring--this will soften the caramel and chocolate and make it, in my opinion, a more enjoyable experience. But you follow your bliss.